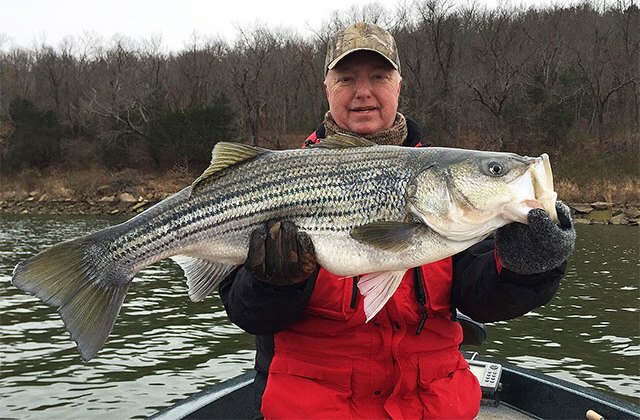 A look at the big bass record books is often enough to convince bass anglers in a variety of states to leave the warm comforts of home behind for a trip to big bass water. Because cold weather and water or not, the winter months can be a prime time to catch the bucketmouth bass of an angler's fishing dreams. Need proof? How about the 18.18-pound Texas state record largemouth bass, a Lone Star State benchmark bass that was caught in January 1992 by crappie fisherman Barry St. Clair. How's that for some double-digit motivation to leave behind the warmth of a fireside hearth to go out, brave the chill and try to find a little big bass magic? But when anglers decide to go out and chase their own wintertime big bass dreams, they should make sure that their trip starts, continues and ends with safety as the first and foremost consideration. Because there are few – if any v second chances for an angler who gets into trouble during the winter months. A time when water temperatures in the low to mid 40s and air temperatures in the same vicinity all conspire to make for a potentially deadly one-two cold punch of cold water and weather. So how does an angler target bass when Old Man winter arrives on the scene? The first – and the best – wintertime angling safety recommendation is to never fish alone. While that's good advice at any time of the year, it's especially true during late November, December, January and February. "If you do fish alone, make sure that someone knows where you’re going to be, where you’ll be on the lake and when you’ll return,” agrees Major League Fishing and Bassmaster Elite Series pro Kelly Jordon, an East Texas pro who has spent many a wintertime day chasing big bass. Second, it should go without saying that anglers should always – ALWAYS – wear a U.S. Coast Guard approved lifejacket throughout any and all wintertime fishing trips. Because an unexpected fall into frigid water can quickly numb an angler's extremities and bring about rapid, death dealing hypothermia. Put simply – and bluntly – if you don't wear your Coast Guard approved PFD, it won't do you any good if you stumble and go in. And if you do stumble and go in during a wintertime angling excursion, the results could be both tragic and deadly. A third safety measure to keep in mind – and this is not an exhaustive list by any measure – is to keep a mobile Smartphone or a waterproof marine radio handy on such a trip. Of course, water and electronics rarely go together, so keep your communication device(s) in a watertight container carried aboard your rig during any sort of winter fishing trip. In addition to the above considerations, Jordon also recommends that anglers dress for a day on the water in layers of warm, waterproof and windproof high-tech clothing. All of which can ward off winter’s dangerous wetness and chill, something that can help an angler make wiser decisions on the water. While that's a good consideration for making sound fishing decisions, it's an even better one for safe boat operations and an angler's movement on a rig's front deck throughout the day. Such bulletproof wintertime clothing include a Simms Fishing ProDry, a rain suit that is both windproof and waterproof, and the STORMR STRYKR foul-weather system. For a variety of MLF pros like Kevin VanDam, Gerald Swindle, and others, such a wintertime waterproof/windproof clothing choice will be a Huk Foul Weather Gear jacket and bib combination. And for still others, that's going to be a Bass Pro Shops 100 MPH Gore-Tex rain suit, a Cabela's Gore-Tex Guidewear rain suit, an Under Armour Storm Sonar rain suit, Frogg Toggs suit or an ArcticShield jacket and bib combo. The point is, that whatever the brand of high-tech outerwear that an angler chooses to use on a wintertime fishing trip, such clothing is invaluable. Another consideration – just in case an angler accidentally gets wet during the winter months – leads Jordon to recommend carrying an extra set of dry clothes, an extra jacket and bib and maybe even a sleeping bag in their boat. Why? To help an angler get warm and ward off any potential hypothermia effects caused by any sort of accidental soaking. He also recommends keeping such extra clothing secured in waterproof bags or containers that are placed in a dry storage locker. 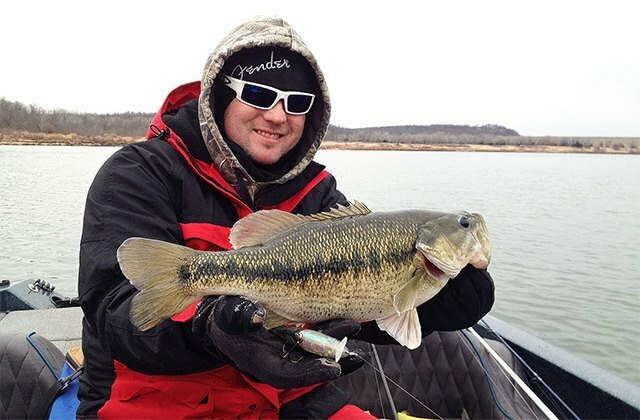 The bottom line is that the wintertime months can bring about some of the best action for the biggest bass of the year in many states like Texas, Oklahoma and Alabama just to name a few. Which is why you'll find local boat launch ramps at Lake Fork, Grand Lake and Lake Guntersville all being active spots even if the thermometer happens to be down in the 20s, 30s and 40s over the next few months. Because cold water and chilly weather or not, a double-digit bucketmouth bass of a lifetime can be the result for a day spent out on the water during Old Man Winter's time of the year. You might only get one or two bites on such an excursion, but they could be bites you'll never forget. Just be sure that you stay dry, safe and sound during that fishing trip as you look for the lunker largemouth bass of any angler's lifetime.